Six-year-old Ian’s parents Anthony and Autumn Nelson are calling for the teacher to be fired. What took place outside the bathroom at Riverdale Kindergarten School left the parents of the boy shocked. 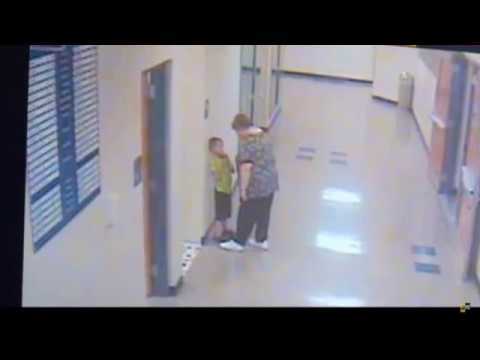 The boy who attends the Ohio kindergarten was seen going to the restroom and upon leaving he was confronted by his teacher. She picks him up by his neck and pins him against the wall and continues her abuse. When the parents questioned the school, they failed to comment on the situation. Many believe the school wants to save their themselves from a lawsuit and were hesitant on releasing the CCTV footage. Teacher Barb Williams still has her job at the school and was told to have a week off, until the media died down. Since the situation, the boy has been put into ‘time-out’ during all of his lunch breaks. TEACHER BEATS UP LITTLE KID AND DOESN'T GET FIRED!! !MUST WATCH!